SAN FRANCISCO— Pacific Gas and Electric Company (PG&E) today announced it will increase financial incentives for energy-efficient construction practices in homes or businesses rebuilt after a wildfire. Customers participating in the Advanced Energy Rebuild initiative will receive incentives to adopt building practices now that will become required for all new construction in 2020. The enhanced incentives will be available to customers who lost a building in a recent major wildfire like the Carr or Camp fires. “These new financial incentives cover some, if not all, of the additional cost of higher-efficiency appliances and building improvements like insulation, advanced windows, air sealing and heat pumps for water and space heating. The result is a more comfortable and sustainable building with lower utility bills for generations to come. We realize our customers have many priorities and challenges right now, and hopefully this program will help,” said Aaron Johnson, a vice president in PG&E’s electric operations who is leading the company’s rebuilding efforts in Butte County. The Advanced Energy Rebuild program was originally developed by Sonoma Clean Power and PG&E after the October 2017 wildfires in the North Bay. Today’s announcement makes the same program available to all areas impacted by wildfire – not just Sonoma and Mendocino County customers. To date, approximately 100 customers have taken advantage of Advanced Energy Rebuild in the North Bay. “The Advanced Energy Rebuild helped our family reach our goal of designing and building the most efficient home possible. Funds from this program helped offset upgrades in our HVAC system and water heater that would have been extremely difficult to do to otherwise,” said a participant in the program from Sonoma County. California’s Building Energy Efficiency Standards, called “Title 24, Part 6,” guide residential and nonresidential building and construction across the state. The standards help to lower energy costs and reduce greenhouse gases associated with the building. Single family homes built to the upcoming 2020 requirements will use approximately 20 percent less energy than homes built to the 2016 standard. The Advanced Energy Rebuild initiative offers customers the opportunity to receive incentives to take these steps a year early, resulting in support for their rebuild and a high performance, low energy use home. PG&E is encouraging customers to build high-performing homes that will result in lower energy bills. Customers can receive between $7,500 to $17,500 in incentives depending on building choices they select. An efficient, all electric home with solar would earn the highest incentive. Incentives are available to serve customers with destroyed homes or businesses in nine Northern California counties – including Mendocino, Sonoma, Lake, Napa, Solano, Butte, Yuba, Plumas and Nevada – where wildfires occurred in 2017 and 2018. These customers are eligible for incentives if they pull a permit for a new building by the end of 2019, regardless of where they rebuild. or for further inquiry please contact us at Rebuild@pge.com. Funding for the program is from public service program surcharges on utility bills that are designed to increase conservation and energy efficiency in California. The Soroptomist International of Burney-Fall River is sponsoring a contest to decide the theme for Burney Basin Days 2019. The person whose theme is chosen will win $100. The deadline for submissions is April 20. Put on your thinking cap. You could brighten up Burney Basin Days with an inspiring them and win $100! On Tuesday April 16, 2019, the Shasta County Board of Supervisors will consider the Friends of the Intermountain Libraries Inc. (FOIL)’s proposal for the County to purchase and renovate the Roper building on Main Street in Burney for an upgraded Burney Library as part of the Shasta County Library system. The meeting will be held at in the County Supervisors hearing room at 1450 Court St. in Redding and is scheduled for 9 a.m. on April 16. The meeting is open to the public. All citizens are welcome to speak before the Board. People who wish to address the Board can fill out an online form in advance or sign up 15 minutes before the meeting. FOIL is requesting that the $400,000 in grant money that was set aside from the Hatchet Ridge Windmill fund in 2014 be released for the project. The Board of Supervisors will be hearing FOIL’s proposal as an action item. If FOIL’s plan is approved the new library building will be almost twice as large. It will have private rooms for tutoring, study, counseling and consultations. There will be a special children’s corner and a meeting room for community meetings. There will be more computers with excellent broadband access. The library will be in a central location on Main Street above the flood plain with ample parking and improved air conditioning and heat. There will be improved services for all citizens of all ages in the Intermountain community and visitors to the area, including some services for veterans and people searching for employment. People will have access to the extensive databases and resources that a modern public library offers. According to FOIL, the Roper Building is the only available commercial building in Burney and is affordable at $300,000. FOIL has worked diligently with the community to raise funds for the execution and completion of the project. Burney Rotary has granted $10,000 and Rotary International has granted and additional $15,000 dedicated to a Children’s Corner. According to FOIL, Shasta Regional Community Foundation has also awarded $7500 for remodeling construction needs and the McConnell Foundation has awarded up to $100,000 should there be shortfalls in the project’s funding package. Over 1500 residents have signed petitions to help the campaign and local children sent postcards in support. FOIL has been working with several supportive organizations to develop and fine tune the plan. Kim Niemer, Redding Community Services Director, who oversees governance of the Shasta County Library System has been involved. So have members of the Shasta County Library Advisory Board, Shasta Library Foundation, and the Library Director for the Shasta Public Libraries. Both the County and City of Redding have looked at the building repeatedly to determine what updates need to be made. If the $400,000 dedicated to this project is released, an escrow will be opened whereby the County will purchase the building and maintain it. Through a collaborative effort between the County, City of Redding, who is in charge of the Shasta Public Libraries system, and FOIL the building will be brought up to current ADA standards. FOIL is encouraging people to contact members of the Board of Supervisors and to attend the meeting on April 16 to express their support. 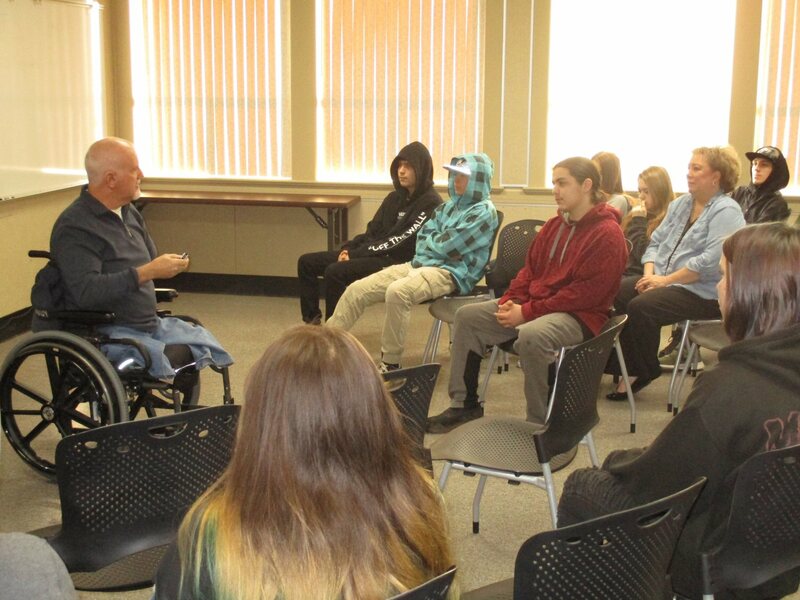 Missing all of his limbs, except for his right arm, seated in a wheelchair, Bob Mortimer addressed the students and staff of Mt. View High School and Burney Community Day School. He had a cheerful opening that put everyone at ease. He put on shades and played his “one arm man blues” song on his harmonica singing playful lyrics that made light of his physical condition. He word a ball cap on his head with the word “Handy” on it. 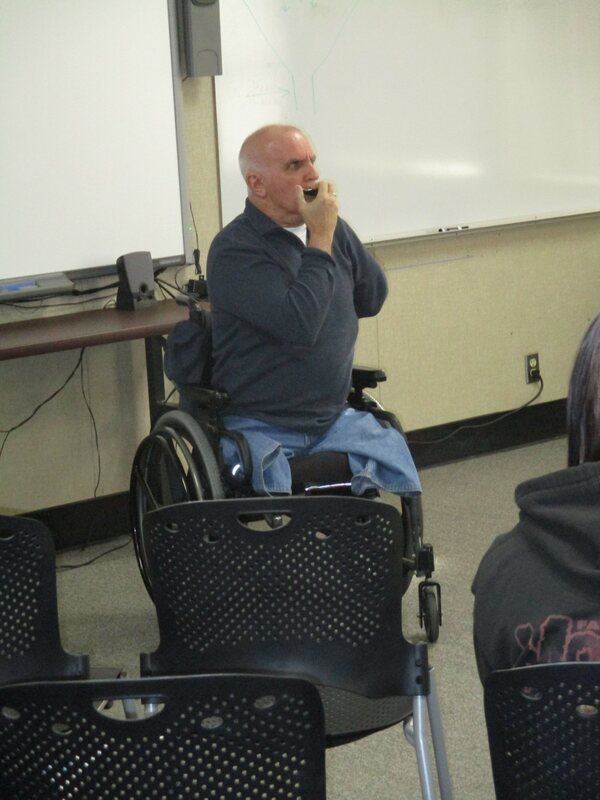 Bob’s presentation was brought to the FRJUSD office and sponsored by Carmen Schuette of Shasta County’s Health and Human Services Agency. His objective was to talk about how he came to be in his physical condition, and what we as people, young and older, can learn from his experience. Bob was in a car accident when he was 21 years old. Now (age) years old, Bob told the story about how he and his buddy were drinking and driving on their way home from a party one night, hit a power pole, and survived the crash without a scratch, that is, until Bob tried to get out of the car and walk up the side of the hill. That is when he was struck to his knees by a loose power line. His legs from the knees down and his left arm were seized by the electricity, and he was rendered without their use. He spent 6 months in the hospital in recovery, eventually consenting to have what was left of his shriveled limbs to be amputated when it became clear they could not be saved. Bob went on to say that he has a nickname at the local community pool. “They call me Bob,” he said with a grin. “Yes, I go swimming. I don’t let this condition stop me. A handicap can be an attitude of low self-esteem, comparing ourselves to others, or not exercising. We all have to exercise!” Mr. Mortimer explained that he rides a 3-wheeled bike and that he bikes with his whole family using his hand cycle. He and his family have biked together cross-country through the United States twice, making stops along the way to give his testimony to those they meet. “Children benefit from developing relationships with adults in the community,” according to Rosaura Velazquez, Family Advocate with the Bright Futures program at the Intermountain Community Center. For that reason, and because young children need to become familiar with local first responders and their equipment, the Annual Lunch with Community Helpers is being planned. Rosaura and her bi-lingual co-worker, Guadalupe Scholfield, are working with Diane Murphy and the staff at Dignity Health Connected Living to plan this free Week of the Young Child event. The Week of the Young Child is a time for communities nationwide to honor young children and those dedicated to caring for them. Young children will learn safety tips from fire, emergency medical personnel and other community helpers, have an opportunity to look at their gear and examine their vehicles. There will also be an opportunity to meet Smokey Bear. All of this will take place at the Intermountain Community Center at Main and Commerce Streets in Burney on Wednesday, April 10, from 11:00 to 1:00. “It is important that young children become accustomed to First Responders and their gear. They can look scary. If there is an emergency in a child’s home, we don’t want them to hide. We want them to know what to do” said Bright Futures Family Advocate Guadalupe Scholfield. A barbeque lunch will be served to all the children, their parents and caregivers, First Responders and seniors, thanks to funding from First 5 Shasta. Additional contributors to the event are K & K Distributing and U S Foods. “We’re hoping for warm spring weather so that we can be outside, says Rosaura, “but if April 10 is cool or rainy, we have plenty of space indoors for all of the festivities. Anyone wishing to attend is encouraged to call 335-4600 so we are sure to have plenty of food. Redding California –Shasta County joins the nation in kicking off National Child Abuse Prevention Awareness Month! This is a time to acknowledge the importance of families and communities working together to prevent child abuse and neglect, and to promote the social and emotional well-being of children and families. From Oct 1, 2017 to Sep 30, 2018 there were 675 children with one or more abuse or neglect allegations in Shasta County. This is a staggering statistic that is unfortunately rising. 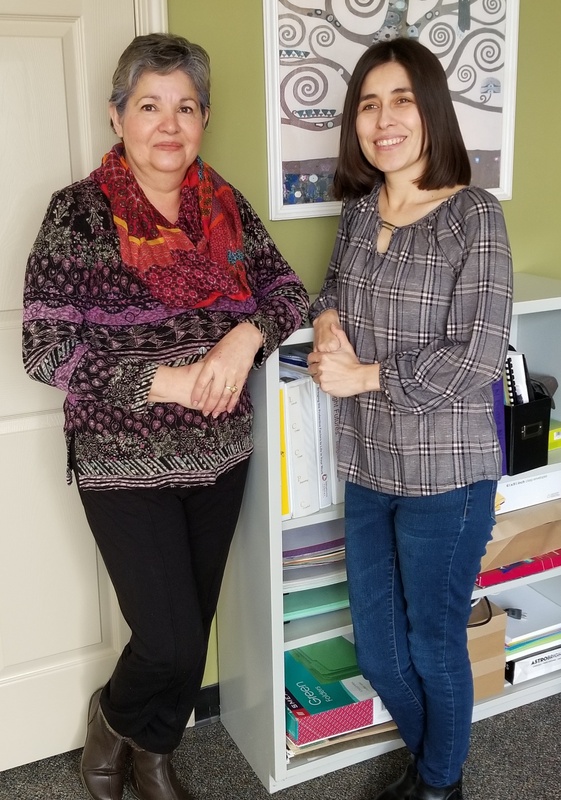 The Shasta County Child Abuse Prevention Coordinating Council (Shasta CAPCCC) has been on the front lines fighting against child abuse and neglect for several years. We believe that together, our community must work towards creating a place where no child is harmed by abuse and neglect. To keep our children safe, community-minded individuals across the state are standing up for families; let’s join that stance here in Shasta County. Join us on March 26th at the Board of Supervisors Chambers (1450 Court Street, Redding) at 9:00 a.m. as we proclaim the month of April as Child Abuse Prevention Awareness Month in Shasta County. Shasta CAPCC Board member Doctor Sean Dugan will be accepting that Proclamation. There will be additional Proclamations on April 2nd at 6:00 p.m.: City of Anderson, City of Redding or City of Shasta Lake all at the specific City Hall buildings. Attend the Pinwheel Garden of Hope Planting Ceremony on April 3rd at noon at The Shasta CAPCC office lawn: 2280 Benton Drive, Redding Ca. Plant a pinwheel in the ground and make a stand: every child deserves to grow up free of abuse and neglect. The pinwheels reflect the bright future that all children deserve. The pinwheel is a positive emblem of the effect we can have when we work together to prevent child abuse. That day, individuals can also take home a FREE pinwheel garden that they can plant in front of their home or business. Wear blue! You can show support by wearing the color blue at any prevention related events during the month of April but there is also a National Wear Blue for Kids day and that is April 5, 2019. We encourage that you tag Shasta County Child Abuse Prevention Council on Facebook to spread awareness of the Pinwheel gardens and for #WearBlue4Kids. 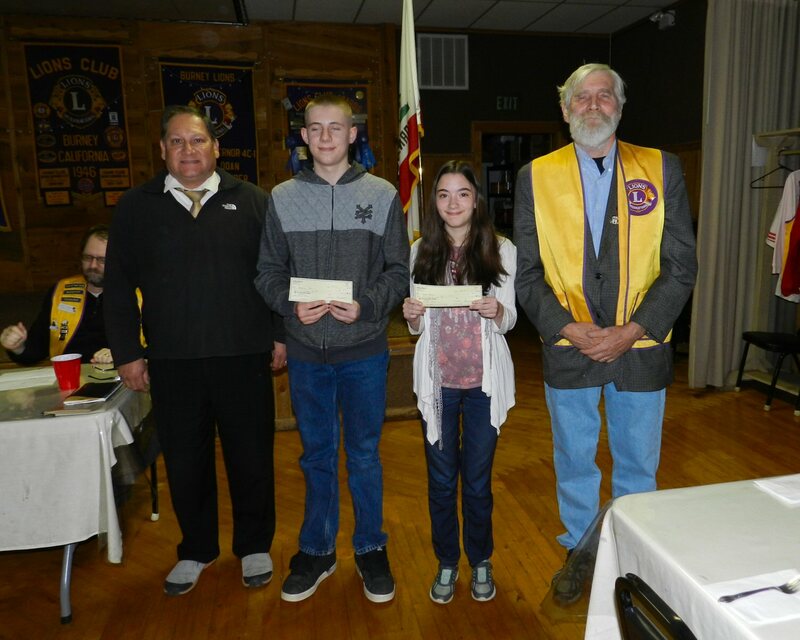 Tessa Perkins and Sebastian Mitchell Penn were honored as Students of the Month at the Burney Lions Club on Thursday evening October 21. Ms. Perkins was named 8th grade student of the month for February, and Penn was named 8th grade student of the month for March. The students were introduced by Burney High School Principal Ray Guerrero. Perkins has a 4.0 grade point. She is active in volleyball and plays flute in the band. She also enjoys playing piano, drawing, and writing stories. She would like to train a dog or a cat. When asked how she would train a cat, she said, “Like a dog!” After finishing high school, she plans to attend college to get a four-year degree. Tessa’s parents Annie and Herb Perkins and her grandmother Linda Bates attended the dinner to see their daughter honored. Her mother, who noted that Tessa has had two surgeries for cerebral palsy, said they are very proud of their daughter’s achievement in academics. Eighth-grader Sebastian also has a 4.0 grade point average. He competes in track and enjoys mowing lawns. He is looking forward to playing football. He is also good at baseball and tennis. He likes to read. In the future he would like to be a cook in the Navy. Sebastian’s parents Jennifer Mitchell and Ellis Penn also attended. Mr. Penn said that he is very proud of the person that his son is becoming. Each student was presented by Lion George Whitfield with a check from the Burney Lions Club for $50.